Happy New Year! Hope you all had a wonderful holiday season. Any leaves and debris should be cleaned up off the lawn to prevent killing the lawn below. If you had a new lawn put in late last year, the minimum amount you walk on it the better, as that will cause depressions in the lawn if it is wet. After heavy winds or snowfalls, deal with any breakage and damage done to shrubs and trees as soon as possible to prevent further damage. All breaks should be given a clean cut with pruners or a saw to prevent water buildup causing rot, and to prevent disease from attacking a weakened plant. The wind also tends to fill the house gutters up with debris, so it’s a good idea to check them regularly and keep them clean. If we get snow, it’s a good idea to brush your plants off from fresh snow to keep the weight off of them and prevent damage. Do not remove snow from a plant if it has had a chance to freeze, because you will cause more damage then you’ll prevent. Try to stay dry and warm, and start planning for spring. It’ll be here soon! Now is a great time of year for simple garden maintenance, pruning and planning for the upcoming season. Cutting back and cleaning up perennials, cleaning dead needles out of conifers (especially pines), and general garden clean up will get the garden in shape for spring. Spring bulbs and early perennials are starting to bloom and grow and a clean garden makes them easier to enjoy. If you are planning to top-dress the gardens where there are bulbs planted, you may want to do it soon so you don’t trample all over the new bulb growth. It’s also a good time to clean out the shed, sharpen and clean tools and get any repairs done that may be needed on lawn mowers, weed eaters etc. Eaves troughs and downspouts should be cleaned if they haven’t been already. Many pruning tasks can be done now. For more information on what and when to prune, go to General Pruning Tips. Also, to get a jump on spring lawn care, go to Lawn Care Tips. Dormant spray should also be applied now. Dormant spray is a combination of lime sulpher and dormant oil used primarily on fruit trees, but is also used on roses and other deciduous trees and shrubs. Spraying now, and one more time before bud break, should help to kill off over wintering pests and diseases. Ideally twice during the dormant season is great; the first spray can be anytime after the trees are completely dormant, usually by mid December, and another application can be made in January or February. You need to spray on a dry day; preferably without rain for at least 12 hours. If you only get the chance to spray once, that’s good too. You should also be planning any changes for your garden now. Seed catalogs and gardening magazines will have lots of great information and ideas for the spring garden, and watch your local papers for ‘Seedy Saturdays’ and garden shows. It is already that time of year for us lucky people in our area of Vancouver Island, so get ready cause spring is right around the corner! For information on lawns go to Lawn Care Tips. This is a great time to get a jump on the weeding in your garden. All those weeds that have flowers on them now are going to go to seed and create new weeds for you to deal with later in the season. If you have limited time, just go through the garden and pick the weeds that have flowers now, or are about to bloom, and get the rest next time – this will save you time weeding in the coming months. Cut back perennials and ornamental grasses that have been left over winter. Divide and move perennials if necessary, and incorporate new plantings as needed. Fertilize bulbs with a slow release fertilizer, and now would be a great time to top dress the perennial garden with fish compost, or other organic product of your choice. Bare root perennials and summer bulbs are coming available now at garden centres, as well as pansies and primulas for early spring colour. Also new plants are starting to arrive, so go shopping! Incorporate organic materials (compost, manure, peat, lime etc.) into the vegetable garden before planting new crops. Seed cool season vegetables such as lettuce, peas, spinach and Chinese greens, radishes, turnips and onions. For tips on what and when to prune go to Pruning Tips. Check spruce trees for first signs of aphids, and spray if necessary. Your local garden centre staff can help you with pest problems – be sure to take a sample in a sealed container or baggy with you to help them determine your problem. Stay on top of the weeding – they are going to start coming up fast and furious and you should fight back just as furiously! It’s also a good time of year to top dress garden beds with mulch – should you choose to use bark mulch, be sure to fertilize also, or use fish compost which has the benefit of fertilizer as well as being a nice mulch. 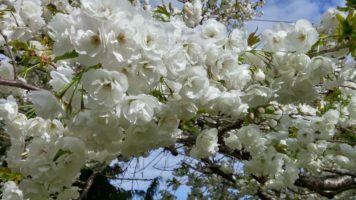 A couple of things to think about before you mulch…make sure flowering cherries in your garden are finished dropping petals, as they do make quite a mess, and also, if you plan to pressure wash any patios or walkways near the garden beds, do that first as it also creates a mess in the garden. Early flowering shrubs such as forsythia, ribes and heathers, and flowering cherry trees can be pruned back when done flowering. Evergreen hedges are about to put on new growth, so you might as well wait until early summer to prune. Everything can be fertilized this month. You can do this by topdressing with organic materials such as fish compost, manure or composted soil, or by using fertilizers available for specific plant requirements. Your local garden centre staff should be able to help you with all of your options. Be sure to watch for aphids on the new growth of your trees and shrubs. Spruce trees are particularly affected by these little critters and can do a lot of damage. Another favorite of aphids is roses, so be sure to check these plants carefully. There are many organic products available to deal with these pests. Make sure to speak to a knowledgeable salesperson when purchasing products to deal with pests. Perennial gardens should be cleaned up and fertilized. You can still be dividing and moving perennials if necessary and lots of plants are becoming available now to purchase. Stakes or cages should be put on your perennials now before they get to big. I find the simplest way to deal with floppy perennials is to use tomato cages or peony rings for support – if put on early enough, the plants will grow into them and eventually the cages disappear. Bulbs should be fertilized now with bone meal or bulb food. Keep them deadheaded, but allow foliage to die back naturally so energy goes back into the bulb. If they are getting messy, just gather up the foliage and tie it up to keep the garden tidy. Make notes or take a picture of your garden so you know what bulbs should be added in the fall. Summer bulbs can be planted or potted up now. Start watching for slugs now, before they start damaging new growth on plants. Slugs can be controlled by store bought baits, or small cups of beer in the garden. Another option is rolled up wet newspaper – in the morning you will find them hiding under there and you can dispose of them. The other pest showing up now is those nasty weeds. Stay on top of the weeding, because they will come up with a vengeance for the next couple of months and you don’t want them to get out of hand. A once or twice a week sweep of the garden will prevent them from flowering and spreading. Yay, it’s time to start the veggie garden! I love getting the veggie garden started, because it’s one of the few areas I seed and its fun waiting for seedlings to pop up. Last fall I top dressed the gardens with fish compost and covered them up to prevent weeds and to keep my cats from using it as a litter box. I uncovered them, added some bone meal, lime and organic fertilizer then cultivated everything into the soil. Everyone seems to have a preference as to what organic fertilizer to use, whether it be steer, mushroom or chicken manure, or fish compost or sea soil. All of them are good. Use what you like and what works for you. The important thing is to use something that will add nutrients to the soil. Most veggies prefer an alkaline soil rather than acidic, which is why I add the lime. The exception is potatoes, do not add lime to the potato garden. If you’re not sure what kind of soil you have, you can buy Ph soil test kits that are simple to use. Once your beds are ready, you can plant cool season veggies such as beets, turnips, asparagus, lettuce, spinach and other greens, peas, radish, green onions, rhubarb, broccoli and cauliflower, leek and potatoes. Most root vegetables do best from seed, or are available as seed potatoes or onion starters. Asparagus and rhubarb are available as roots, and are hard to find after mid April. Also available now are blueberries, strawberries, raspberries, grapes and kiwi. Be sure to protect your garden from quails and other animals with netting. One year the quails completely cleaned out my garden right after all my seedlings appeared. It was very disheartening, and I’ve netted my gardens ever since. It also keeps those nasty cats of mine out of the garden! Well that’s it for now. Hope you have a wonderful April filled with sunshine and seedlings! Happy gardening. May is such a fabulous month in the garden. Rhodos and other flowering shrubs are blooming, the conifers are showing off their new growth, the perennial garden is getting more interesting, it’s getting warmer (hopefully! ), and we have the whole summer ahead of us yet. Life is good! Along with the flowers we’ve been waiting to enjoy, the weeds will also be loving the warm temperatures and will come on with a vengeance. Stay on top of the weeding duties while the weeds are actively growing, or you’ll be sorry. Just think, all the hard work weeding over the last couple of months will give you more time to enjoy the dog days of summer coming up! Also, I know we are used to having all that rain, and probably haven’t gotten into the habit of watering yet. It’s time to get your irrigations systems turned on and the hoses out ready to go. Watering season has arrived. If you are lucky enough to have irrigation, make sure everything is working properly. Turn it on manual, and tour your garden to make sure all sprayer heads etc. are working, and covering the areas their supposed too. A helpful hint for watering – Many perennials and flowering shrubs will get fungus problems from overhead watering. If you are watering by hand, water at the base of the plant rather than the foliage and this will help prevent fungus problems. Also, there are many suggestions for the best time to water your garden. I think the best time is early in the morning, so that everybody is watered and ready for the day. Mostly I do my extra watering when I have the time, or if it’s absolutely necessary. The important thing is that they get watered as regular as possible. Strong, healthy plants will resist pests and disease better than a poorly cared for plant. Keep an eye out for slugs in the garden, particularly if you have hostas or other such yummy, leafy, fleshy perennials emerging from the ground. If you have them, they will come, so get out your slug bait or beer dishes and deal with them now before they start to multiply! Also, watch for aphids anywhere and everywhere because they’ll be around too. Since annual season is upon us, we should talk about transplanting and hardening off of tender annuals and vegetable starters. Hardening off is the process of climatizing plants coming from a greenhouse or protected area, to be planted out in the garden. In the early part of May, start by moving your transplants outside during the day, and back in under cover at night. Put them in a dappled sun area, not in direct sunlight. Closer to planting time, the hardier annuals like alyssum and bedding petunias can be left outside at night with some protection (like an eave). Annuals shouldn’t be planted outside until mid May, and the more tender ones like impatients shouldn’t be planted out until the later part of May when night time temperatures have really warmed up. Tomatoes, peppers, zukes and cukes should be protected at night until early June before planting out. If you plant out too soon, your plant will be stunted, and will take longer to recover than if you had just waited another week or two. Tomatoes and peppers can be potted up and grown in a cold frame so they are a nice size when they get planted out. Make sure to plant your tomatoes and peppers deep, to the bottom of the lowest leaves, to encourage root growth along the buried stem. All annuals and vegetable starters should be watered in with liquid transplanter solution, which is available at your local garden centre. This will give the roots an immediate boost, and better your chances for strong plants. Also, if your plants have matted roots, massage the roots to loosen them before planting, and they will happily grow into the soil you have provided. When purchasing hanging baskets, don’t buy anything smaller than a 12” basket. A smaller basket will dry out too quickly, and are generally over planted. Most baskets that you buy already full at this time of year, will be pretty much spent by mid or late summer. Also, many are for sale way too early for them to safely go outside at night time. If it’s at all possible, make your own. It is so much fun, and is really quite simple. Start with a 12” or larger hanging basket with drainage holes. I use green plastic because they are inexpensive and protect from drying out as much in the wind. Do not use a tray with your basket, or you could end up with rotting problems. I use a soil mix of 2 parts peat and perilite to one part composted soil. I add bonemeal and organic fertilizer in my soil mix, and also a little lime. You can also purchase bagged basket soil mixes, but I generally like to add some soil to these because I find them to peaty. Choose your plants carefully according to your sun conditions and preferences. Plant something with some height in the middle, and a combination of trailing and filler type plants around the outside. I generally use one or two centre plants, and five or six trailers or fillers in a 12” basket. Water in well with liquid transplanter, top-dress with slow release fertilizer and you are done! I make mine and hang them up on the third weekend in May. They only take about a month to fill in and cover the pot, look awesome all summer, and last until the end of October. I dead head the flowers and liquid fertilize every two weeks with Miracle Grow. If you haven’t already prepared your vegetable patch and started planting, you had better get busy. See April’s gardening tips on information on prepping the garden beds and what to plant. Those of us who have started, can be sowing seeds for the second harvest of radish, peas and other cool season vegetables. Thinning may also be necessary, weeding and regular liquid fertilizing every two weeks. Wait until early June to plant out tomatoes, peppers, zukes and cukes. Deadhead finished bulbs and early perennials. Fertilize spring bulbs with bonemeal or bulb food if you haven’t already. If you are still moving and dividing perennials, do it on a cloudy day and water them in well with liquid transplanter. Staking should be done before plants get to big, and keep the gardens weeded. Add new perennials and summer bulbs in the empty spaces, fertilize every two weeks with liquid fertilizer, and watch your garden grow! Dead head early flowering shrubs when they are finished blooming. Pruning of hedges can be done now or in June, and conifers should be pruned in late May or early June. If you haven’t yet fertilized, then do so using organic fertilizer or fertilizer specific to your plant needs. Watch for tent caterpillars and other pests and if problems arise, deal with them immediately. Your local garden centre can help you if you don’t know what to do. For lawn care see Spring Lawn Care Tips. June is the month for roses and peonies, and watching the perennial garden grow by leaps and bounds. Every night my garden walk provides me with something new to admire, as I watch plants fill in and start to bloom. To keep everything growing and healthy, perennials, hanging baskets and flowering shrubs should be getting fed with a liquid fertilizer every two weeks. Make sure to keep annuals and perennials dead headed to promote more flowers, and stake tall plants to keep the garden looking tidy. Most of us should be at the stage of enjoying and maintaining our gardens, now that the major planting season is coming to an end. Keep up on the weeding, and keep an eye out for pests and diseases and treat problems as soon as they arise. Roses in particular are prone to aphids and fungal disease, and should be treated immediately to prevent the problem from spreading. Black spot and powdery mildew are the main culprits of roses, and can be controlled by organic sprays such as Safers Defender, which is a sulpher based spray, or make your own spray by mixing one litre of water with 2 tbsp of baking soda and a squirt of dish soap. If you can’t get a handle on the problem, check with your local garden center for other solutions. Feed roses monthly with a slow release fertilizer made for roses, keep them well watered and dead head finished blooms regularly, and your roses will reward you with beautiful blooms all summer. Pruning can be done on shrubs that have finished blooming. It’s a good time of year to clean up the Rhodos of dead flower heads, dead or damaged branches, and cut back the new growth if you are trying to maintain size and shape. Don’t be afraid to prune your Rhodos…they respond well to pruning, and if you do it immediately after bloom, they will still set bud for the next year. Keep trees and shrubs fertilized and watered. Be careful to water only if necessary, and check out plants individually, as some may get more or less water than others depending on rainfall and irrigation. Some areas of the garden will retain moisture more than others because of sun and/or soil conditions. Tomatoes, squash, zukes and cukes should be planted out in early June. Keep tomatoes staked and caged, and well watered, being careful not to splash water on the foliage. This will help prevent fungus problems on tomatoes, squash and cucumbers. I usually seed my carrots in June, and don’t seem to have any problems with carrot rust fly. Second plantings of lettuce and green onions can be done. Fertilize every two weeks with liquid fertilizer and keep the garden evenly watered. Have a nice summer, and don’t forget to stop and smell the roses! Summer is here and it is time for fun in the sun. Don’t forget to water the garden!!! I know I harp on this point, but it is truly one of the most important things to remember to do. Casualties happen quickly in hot temperatures and lack of water. If you are planning a holiday, please make sure someone is watering for you if you haven’t got irrigation. Hanging baskets and container plants especially will need extra water, probably twice as much as the rest of the year. Wind is also a big factor in drying out baskets. Early July is a good time to take down your baskets, do some trimming and dead heading, and replacing any casualties. They will grow back quickly and this will help to prolong your bloom season. Check for aphids and whitefly and treat if necessary; continue to fertilize with liquid fertilizer every two weeks, and your baskets will last well into October. Shade trees and Japanese maples should be watered deeply 2 to 3 times a week. If they get too dry the leaves will brown and dry, but established plants will usually be fine once watered, if not left too long. The lawn is also going to dry out, so take advantage of your watering days with a little extra on the lawn. Make sure to water in the early morning or late evening if you are using sprinklers. Most of the water evaporates in the sun if you water during the day. Do some pruning in the perennial garden. Mine is over planted, of course, so it requires a shrewd hand at the end of the pruners. I used to hate to cut back the plants that were crowding others, but now I just put the cuttings in a vase and put them in the house, and the garden looks much better. Never be afraid to cut back a perennial, because they will come back full and lush, and maybe even flower again. Continue to fertilize perennials, annuals, flowering shrubs and baskets with liquid fertilizer every 2 weeks. The vegetable garden is filling up with peppers, squash and tomatoes. The tomatoes, cukes, zukes and squash will all want more water and food right now while producing these wonderful luscious beauties for us to enjoy. Give them what they want, and you will be rewarded. So there you have it. July and August are months for holidays and fun, and to sit back and enjoy the garden. All our hard work in spring is paying off now, and I hope you all enjoy your gardens as much as I enjoy mine. See you in September. p.s. Don’t forget to water! Dead heading and liquid fertilizing the baskets, annuals and perennials will keep them blooming as long as possible. Roses will also continue to bloom well into November if you keep them deadheaded and fertilized. 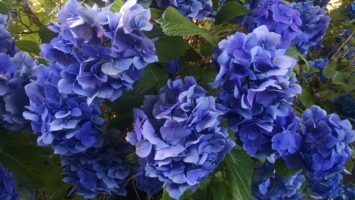 Now is a good time to remove the finished flowers on hydrangeas, and do the final pruning on broad leafed evergreen hedges and shrubs. Spring flowering bulbs are appearing everywhere for sale, and now till end of September is a great time to buy, because you’ll have the best selection. Don’t plant out until late October or they will start to grow, and for now store them in a cool, dark, dry area. Make sure the bulbs you buy are firm and have no mould on them. If the leaves are already falling, keep them raked up off the lawn to prevent damaging the grass. If you are planning on doing any lawn maintenance, this is the month to get the seeding done if you want decent germination. I know most people want to wait for more rain before they seed, but you also need warmer temperatures during the day for germination, and at night so seedlings survive, so I recommend you have your seed down before the end of the month. Weeds will be actively growing again, so stay on top of the weeding. Most other maintenance such as liming, aerating and fall fertilizing can wait till October. The harvest should be great in the veggie garden right now. Tomatoes, squash, cucumber, peppers, carrots, beets, rutabagas, leeks and onions are all having a party in my garden, and I love it! It’s harvest season! Don’t forget to keep fertilizing the crops you will be harvesting into fall, and make sure to keep everybody well watered. If we are having a cool wet September, it’s my advice to pick all your tomatoes off the vines, and let them ripen slowly in a cool area. It is inevitable that we’ll get a late blight on our tomato vines if it is wet and cool, and it will be too late to harvest once the plant is diseased. Trust me, I know. Pruning can be done now on stone fruit trees such as cherry, plum and peach. They are less susceptible to fungal diseases if pruned before winter. Most other fruit and ornamental trees (except birch should be done now) can be pruned during dormant season. If in doubt, check pruning tips at top of page, and/or phone your local garden centre for information on when to prune trees. Well, that’s all for now. Enjoy the garden this month, and get ready to do some more work in the garden next month. Talk to you then! Lime lawns with dolopril® if you have moss problems. Liming raises the pH, making the soil conditions unfavorable for moss growth. Also, this is the time to feed lawns with a winter/fall fertilizer, which is higher in phosphorus and potash, building roots and promoting disease resistance for the winter months. Your local garden centre will have a fall fertilizer available. Rake leaves from lawns to prevent die-back and fungus problems. Cut back perennials as they finish flowering and start dying back. Move perennials around, and divide if necessary, adding new perennials for next year. If you have newly planted perennials from this year, don’t cut back the foliage until next spring. The plants will benefit from the energy going into the roots as the foliage dies back, as well as the extra protection from winter temperatures. If you haven’t done it already, plant your bulbs soon, so they can start growing roots while it’s relatively warm. Deadhead your roses, and remove diseased leaves from the plants and from around the plants. If tended to, roses should flower until the end of November, or until snowfall. Water shrubs that are under roof lines, under the canopy of a large tree, or in any other sheltered location. These areas are not receiving rain water like the rest of the garden. Keep leaves and debris cleaned up to prevent pests and disease from overwintering in your garden. This is one of the absolute best times to work in your garden so GET YOUR RAINGEAR ON, GO OUTSIDE AND HAVE FUN! Oh… and invite a friend. Now is a great time to transplant shrubs and perennials and add new plants to your garden. They will have all winter to start rooting, and be in their new home early in the spring when they really start to grow. Wait until all leaves have fallen from deciduous trees before you move them, and always use bonemeal and liquid transplant fluid with rooting hormone with all your transplanting and planting. (I really mean it when it’s underlined!) Oh, and guess what? Bare root season is upon us and very soon our local garden centres will be selling bare root fruit and ornamental trees. I am so excited – what a great time to wander around the garden centres and find some new treasure for the garden. Also, balled and burlap hedging cedars are now available, so if you’ve been waiting to plant a hedge, do it now. Make sure the salesperson you are dealing with is aware of your conditions, e.g. deer, water availability, space etc., so they can sell you the right product. Most fruit trees need pollinators, so make you choices wisely. Your friendly garden centre salesperson should be able to help you with all your questions. Get those bulbs planted now! The selection is already starting to get much smaller in the stores. If you do this one thing for yourself now, I promise you will be really happy in the spring when you see those first flowers appear. Daffodils are the first sunshine in my garden every year, and I love them. They are also one of the only bulbs deer don’t eat. Keep the leaves raked up, especially off the lawn. If you have a big leaf maple in your yard that sheds in your neighbor’s yard, you could be really nice and help him clean up too. If your roses are still blooming and looking good, don’t prune them yet. If yours are starting to look not so good, then you should clean them up. Prune them back enough to tidy them up, and get rid of all the leaves from around the plant (do not put diseased leaves in your compost). In March the harder pruning should be done. Check back for tips on rose pruning then. Give a friend in need an early Christmas present – spend some time helping them in their garden. If you’re really lucky, they may return the favour! Do something nice for yourself – add something to your garden, whether it be something someone shares with you that is leaving their garden, or perhaps is getting divided, or something you purchase. Don’t forget, it’s bare root season! If you love your garden and haven’t spent any time in it lately, then make some time. The ‘feel good’ feeling is worth it! Christmas time is upon us, and we all know what a busy time of year it can be. Therefore, we’ll keep it simple in the garden giving us more time to enjoy our friends and family over the holiday season. When it snows go out and shake off your plants. We have many broadleaved evergreens that like to hold on to the snow and eventually it can get to heavy and cause breakage. The important common type plants would be rhodos, choisya, and especially cedar hedging. If the snow on a cedar hedge is left and has a chance to freeze, your hedge may never be the same shape again. Even deciduous trees should be shaken (especially Japanese Maples) because the build up of wet snow just gets to heavy for them. Don’t forget about plants that are under your eaves, they need water too. If the plants are dry and get a bad freeze, you may experience damaged or lost plants in the spring. When Christmas shopping, don’t forget your local garden centres for gift ideas. Most will have lots of fun things like bird baths and statuary, seasonal plants and indoor flowering plants, and there is always a gift certificate which is any gardener’s ideal present. Most of all this month, you should concentrate on your family and friends, because sharing time with them is what Christmas is all about. We wish you all a Very Merry Christmas and a safe and happy holiday season. Lawn care and maintenance on Vancouver Island can be frustrating, but rewarding if you are willing to put a little effort into your lawn. Our climate is our biggest hurdle for lawn care. Seldom do we have a cold and long enough winter for the lawn to go completely dormant. Although it is not actively growing, it is still trying to survive under the winter conditions, which are generally above freezing, dull and wet. These are optimum conditions for winter annual weeds to grow, and especially, moss growth. Along with wet conditions, shade and acidic soil are the 3 major factors of moss growth in the lawn. Of course our rainy season keeps lawns wet, and the shade and needle drop from all our big Douglas Fir trees and other conifers in the area contribute to the acidic soil. Large conifers drop a lot of needles, which compost and increase the acidity in our soil. Also, needles and leaves left to sit on the lawn over winter can cause the grass below to die off. The tips listed below, are a general outline of yearly lawn maintenance. First do an application of dolopril lime. Liming raises the pH in the soil making it more alkaline. This helps prevent moss growth. It takes about 4 weeks after application for the lime to breakdown in the soil, and will allow fertilizer to work better once it is applied. It is recommended that lime be applied in spring and fall, but can also be applied in winter. Next, if necessary, apply a moss control when temperatures reach approximately 10 degrees Celsius Within 7 to 10 days the moss should have died. If there are large patches of dead moss, it is best to rake it out. A spring fertilizer should be applied at the end of March. There are many varieties available, but spring fertilizer will be high in Nitrogen to encourage new growth. Aerating can be done in early spring, whenever the lawn has had a chance to dry out a bit. It is usually early to mid April. Why Aerate? The purpose is to drive air channels deep into turf to break through the compaction layer and provide oxygen and water to the root zone and allow roots to grow. Aeration also breaks up matted area at soil level, and allows better drainage. This will also help with the removal of dead moss left behind after moss control has been applied. Start cutting the lawn when it begins to actively grow. To help prevent thatch building up in the lawn, bagging and removing the cut grass from the lawn will help. Bagging cut grass also helps in preventing weed seeds from spreading. If your lawns needs to be top dressed and overseeded, mid to end of April is usually the best time. Sand or soil can be used, depending on your lawn needs, obviously soil having more organics than soil. Rake out the soil, apply the seed, rake it in, and use a lawn roller to level out the lawn. Apply a turf starter fertilizer, water, and let nature do the rest. Weed control needs to start in April, and continue throughout the year. Weeds inhibit the growth of grass, so a healthy lawn needs to be weeded. Hand weeding is your best defense, but there are some pesticides available. In most areas on Vancouver Island, only organic pesticides are allowed to be used. Check at your local garden centre to get advice on what products are available, how and when they should be used. By early to mid May, it will be time to fertilize again. Depending on the fertilizer you use, it will need to be applied every 4 to 6 weeks. Regular irrigation should begin when the rainy season ends. The most active growth will happen April to June, but to keep a healthy lawn, irrigation is required throughout the year until fall rains begin. If you choose not to irrigate throughout the summer, or can’t due to water restrictions, the weeds will survive and take over. You will have to work harder in the fall when the rain starts again, to keep your lawn in shape. Regular cutting, watering, fertilizing, and weed control will give you a healthy lawn. The type of fertilizer you use will change with the seasons; just ask at your garden centre about the type you should be using. In October you can lime again, and apply a fall/winter fertilizer. If we have a warm winter, fertilizer can and should be used to give your lawn some extra help throughout winter. The following information is very general. Some plants require special pruning techniques, and will suffer if pruned improperly or at the wrong time. It is always best to check with a good pruning book, or speak with a specialist in the field of pruning if you have any concerns. Ornamental Deciduous Trees Most varieties prefer to be pruned in the winter, but there are some exceptions. The following varieties prefer to be pruned in mid-late summer because they will bleed less, and be less susceptible to disease: Betula (Birch), Laburnum (Golden Chain Tree), Prunus (Cherry), and Tilia (Linden). Poplars prefer to be pruned in early winter, rather then spring or summer. Pruning should consist of removal of weak, dead or diseased wood, crossing branches, and for reduction in size or shape. Always make your cut to above a healthy bud or set or buds, and on an angle. Conifers Conifers require little training and practically no pruning except to maintain size or when grown as a hedge. With few exceptions, such as yew and Western Red Cedar, conifers do not grow well from old wood. If your cut back into mature wood new shoots will rarely develop and you will be left with bare stubs. Therefore, only cut conifers back to live, visible buds. Do not cut back into old wood: cut off damaged or misplaced branches completely rather than leaving a stump. If pruning is required to control spread, it should be done in spring or early summer by reducing the length of the thin new growth. You can simply pinch out the new growth. Conifers that produce tight growth in a formal shape can be clipped regularly to retard growth. Some conifers have candles, such as pine and spruce, and you can pinch the candles back for bushy growth, or remove all but the middle candle to promote height. Flowering Shrubs The general rule of thumb is to prune your shrub when it is done flowering. Shrubs that flower in the spring will sometimes set new buds and flower again later in the season. Any major pruning can be done during dormant season. Some shrubs will not flower the next season if pruned to late (rhodos) because they do not have time to set new buds. If your shrub blooms on old wood only (forsythia, some hydrangea etc.) you will not get flowers the next season if you prune it back too hard. Vines Be aware whether your vine flowers on old or new wood or both. This will determine how you prune. If they bloom on new wood only, then you should prune it back to about 18″ above ground level if you want it covered in flowers. If it blooms on new and old, you can let it grow and just prune to keep it tidy. If it only blooms on old wood, then cutting back to hard will reduce the amount of blooms the following season. Most vines should be pruned in spring. Some need maintenance pruning all season long (wisteria)! Time to Prune – Stone fruits are prone to contracting disease if pruned in winter, therefore, early spring and/or mid to late summer is the best time to prune. Plums Plums fruit at the base of one-year old shoots and along the length of older wood. In mid to late summer, once the new growth has ceased, cut all the current season’s side shoots back to 6″ on an established tree. Also remove any very vigorous upright shoots, or any badly placed crossing or inward pointing branches. Cherries Like plums, cherries fruit at the base of the previous season’s shoots and on older wood. In early spring cut back some of the old shoots to young side shoots produced the previous summer. This will ensure that some of the oldest wood is constantly being replaced. Peaches and Nectarines Peaches and nectarines fruit on shoots that grew the previous year. The aim of pruning therefore, is to remove fruited growth and encourage new shoots. When pruning to induce a new shoot, take care to cut to a pointed growth bud, not to plump flower bud. Spring is a great time to rub of excessive buds, and summer after fruiting is a good time to cut back each fruited shoot to its replacement shoot. Small Fruits – Blackberries, Boysenberries, Loganberries, and Tayberries These fruit best on one year-old stems, so, in winter, cut back to ground level all the old stems that have fruited, then tie in the young shoots produced the previous summer. Raspberries Summer fruiting raspberries carry their fruit on year-old stems. In the winter, cut out all those canes that have fruited, then tie in the new canes produced during the summer. If in time the clumps become congested, thin the canes to about 3in apart. Autumn fruiting raspberries carry their fruit on the current season’s growth, so cut all the canes down to ground level during winter. Gooseberries After harvest, remove any badly placed branches, or crowding the center. In winter, reduce the length of the summer growth from the tips of the main branches by half, and reduce the side shoots, which produce the fruit, to two buds from the old wood. Also remove any weak, damaged, diseased or dead wood. Blueberries Do not prune for 3 or 4 years after planting, as they fruit best on wood that is 2 or 3 years old. Once well established, prune in early spring each year to stimulate plenty of strong new growth from the base. Blueberries require an acid soil. Black Currants On established plants, in winter, cut about one shoot in three each year. Concentrate on removing the oldest branches and those which are badly placed, cutting them back as low as possible. Red and White Currants On an established bush, cut out one main branch each winter taking it back to one bud above ground level. If site is windy, reduce the height of the bush. Grapes The first two years, train your main framework, according to the method you choose. In subsequent years, tie in your new side shoots. At the end of the growing season, cut back the side shoots to within two buds of the main stem, leaving stubs called spurs which will fruit next year.